In Fall 2014, Dr. Anthony Scheffler, Dr. Shirley Andrews, and Nancy Sartin were awarded a Round One Textbook Transformation Grant for a collaborative project in creating an open STEM/Teaching and Learning resource library, involving the work of faculty, K-5 educators, and education students. The project was a success, resulting in an open directory of online K-5 math and technology resources. The team’s Final Report included a unique observation: students appreciated the diversity of resources used in their course, where various perspectives could be gathered instead of everything coming from one single source, such as a commercial textbook. He continued to discuss the benefits of the implementation of OER in a panel of early Textbook Transformation Grantees at the USG Teaching and Learning Conference, and was featured in the I Am Affordable Learning Georgia video. 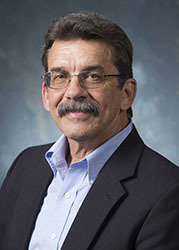 Dr. Scheffler took this experience with him when he became the Interim Vice President of Academic Affairs, leading an effort to integrate open educational resources into a new Competency-Based Education (CBE) initiative, which started with K-5 education and is expanding into core courses at VSU. He is also working with Deb Van Petten, ALG Library Coordinator at VSU, to create an institution-wide OER policy.